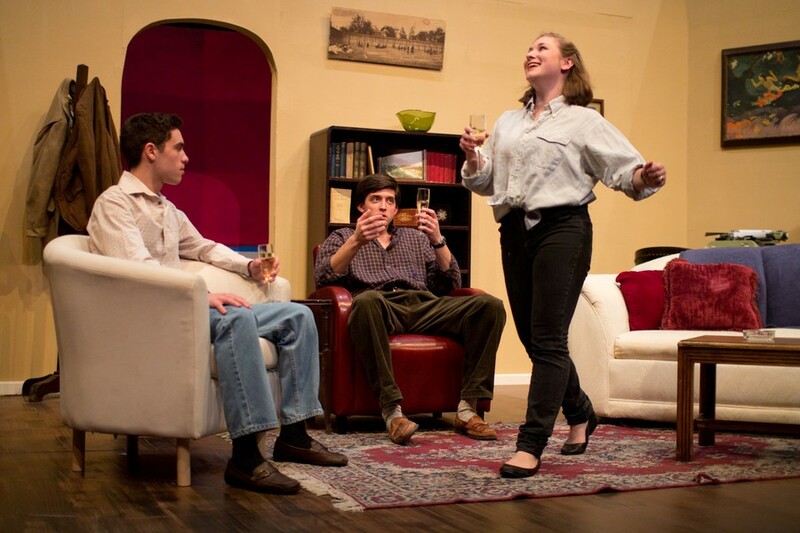 Left to right, first-year Michael Findley, fourth-year Justin Krivda, and third-year Arielle Von Hippel star in the UT/TAPS production of The Real Thing. This weekend in the Logan Center’s Theater West, UT’s production of Sir Tom Stoppard’s The Real Thing will open with a bang. A door will slam, a house of cards will crumble, and shouts of accusation will follow. Clearly, this is going to be riveting stuff. But the title is a deception—this isn’t the real thing. That’s hidden somewhere, and we have a good bit of fun trying to find it. A long-time fan of Stoppard’s work, first-time director and fourth-year Shelly Horwitz jumped at the chance to stage this witty production. The Real Thing proved particularly appealing, as it dwells on a few elements quite familiar to the university student body, namely our well-publicized difficulties in certain areas of self-expression. “I think this type of genre is engaging for UChicago people—really smart people who can articulate intellectual things well, but are maybe not the greatest when it comes to actual feelings and, you know, saying the things they really need to say,” said Horwitz. This is, unfortunately, a fairly accurate characterization, and the reason I no longer attend frat parties. And it’s fortunate that, in a play that largely revolves around actors acting like actors, these actors can act. As Henry’s love interests, leading ladies third-year Arielle Von Hippel and first-year Eleanor Clifford are both quite adept at expressing their characters’ understandable exasperation. Charlotte (Von Hippel) treats Henry’s cynical humor with sarcasm and snide remarks, while Annie (Clifford) does her best to weather his insecurities with due patience. And they’ve found an apt Henry in fourth-year Justin Krivda. Where his snobbish affectations might otherwise have been vaguely annoying, under Krivda’s care Henry is oddly endearing—charming, even, in a relatable sort of way. Krivda is all stage presence, and he wears a sweater as well as anyone in private-university theater today. Fortunately Horwitz has elected to forego authentic accents, although the script’s British vernacular necessarily makes everyone sound kind of like Cary Grant (never a bad thing). Since it is a creation of the man behind Rosencrantz and Guildenstern are Dead, it goes without saying that the script is riotously funny and full of neat little surprises. Beyond the convergence of drama and reality, we’re treated to meditations on love, infidelity, the value of art and the nature of unpolished, original thought. Henry is convinced that words have intrinsic value, that they need to be used well or not at all. As the play unfolds, we’re made to see that eloquence has its place, but that relationships—the ones that matter, anyway—are built on raw, open expression and simple, honest discourse.